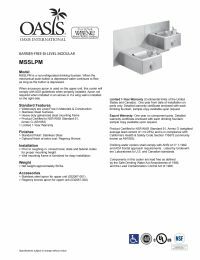 MSSLPM is a non-refrigerated drinking fountain. When the mechanical push-button is depressed water continues to flow as long as the button is depressed. When accessory apron is used on the upper unit, this cooler will comply with ADA guidelines when properly installed. Apron not required when installed in an alcove or if a wing wall is installed on the right side. Complies with ANSI A117.1-1992 and ADA frontal approack. UL listed.